Do your Peachtree City ducts need work? R Fulton Improvements has been installing and repairing air ducts in Peachtree City for the past 20+ years. 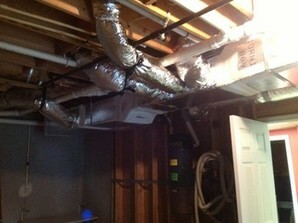 To improve Peachtree City ventilation R Fulton Improvements provides duct cleaning and venting services. Call today to schedule a quote for ventilation services in Peachtree City! (678) 251-9181. Whether it's a new construction residential or commercial building, or you simply need duct systems replaced, call R Fulton Improvements of Peachtree City for all your ductwork. With R Fulton Improvements's experienced Peachtree City duct technicians, you'll be left a high quality professionally installed ductwork. For over 20 years, R Fulton Improvements of Peachtree City has been repairing heating and cooling ducts, no matter how difficult the task. R Fulton Improvements has the skilled staff necessary to improve the air quality and energy efficiency of your home or business. R Fulton Improvements offers the highest level of craftsmanship at the most competitive rates in Peachtree City, GA. Call us at (678) 251-9181 for all of your Peachtree City ductwork needs. We need to meet your needs. Free quotes.